The dribble-drive motion offense, developed by Vance Walberg and popularized by John Calipari, is now being used by many college and high school teams. The basic concepts are spacing, creating gaps, attacking with the dribble-drive, and "inside-out" passing for open 3-point shots (drive and kick). It is a guard-oriented offense that favors a team that might be lacking in tall post players, but strong in good outside perimeter players who can dribble-drive and are good outside shooters. It has been used mainly as a man-to-man offense. This article discusses how you can modify and use the dribble-drive offense in attacking zone and packline defenses as well. Before proceeding however, you must have a basic understanding and familiarity with the dribble-drive motion offense. Click here and/or get Vance Walberg's excellent DVD, or one of several other excellent DVDs listed below. This article comes from our own experience and also from ideas presented by Hall of Fame Coach Jerry Petitgoue, the winningest coach in Wisconsin high school history, at Cuba City High School, with over 40 years of successful coaching experience. If you are serious in learning about and wanting to run the dribble-drive zone offense, you'll definitely want to get Coach Petitgoue's "Dribble-Drive Zone Offense" DVD. Coach Petitgoue is a great teacher of the game and I love to listen to him. 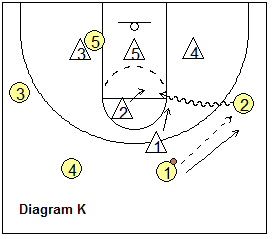 Transition attack... beat the defense down the court and score off the break. This is especially true of the dribble-drive offense, which favors speed and the guard attack. Also the dribble-drive offense is very easy to flow into off the break with O1 and O4 at the top, O2 and O3 on the wings or corners, and O5 running to the rim (and then moving to the weakside once the offense starts) - see Diagram A.
Spacing... spacing is very important to any offense and we have our perimeter players out beyond the 3-point arc, and our post player O5 will usually be "away" or opposite the ball. Against the 2-3 zone, we may start the offense with O2 and O3 (normally in the corners) up higher at the wings (see diagram A). Post touches... in any zone offense, we usually (except in transition) want to get a post touch inside before shooting a 3-point shot, as we can always get the 3-point shot. You still need to get inside and get to the free-throw line. In the dribble-drive zone offense, we are 4-out without a high post player. We treat the dribble-drive to the elbow or lane as a "post touch", as we can now pass to O5 inside, pass to the opposite side, or kick it back out for an open 3-point shot, or shoot the jump shot from the elbow... all the same options of a high post player in a zone offense. Instead of passing to the high-post, we are dribble-driving to the high-post. Screen the zone... Coach Petitgoue uses the term "boxing-out" out on offense in order to get open and I like this term as basically that's what the offensive player does to get open inside, he's boxing-out (or sealing) the defender for inside (open to the ball) position. If the low defender already has inside position, O5 can "pin" or screen the defender inside so that we have an open skip pass to a player in the corner (more below). Other coaches might use the terms "sealing" and "pinning" the defender. Patience... except in transition, your zone offense must be patient. It oftentimes takes a little longer to get a post touch and a good shot against the zone, so players shouldn't get in a hurry and try to force things that are not there. For example, in attacking the 2-3 zone defense, when a player dribble-drives, he cannot usually expect to get all the way to the rim because of the three inside low defenders. He will often have to use a pull-up jump-shot at the elbow or in the lane, or make a kick-out to the perimeter, or dump it inside to O5 "boxing-out" the defender inside. Offensive rebounding... as in any zone offense, rebounding missed shots will get you more shots. We stress that any time an outside shot is taken from a wing or corner, the opposite wing crashes the offensive boards for the back-side rebound. Someone once did a study that found that about 70% of missed outside corner-wing shots go off long to the opposite side. 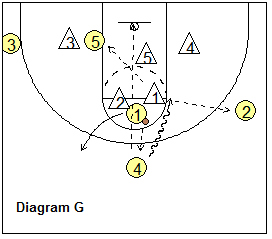 Dribble-attack the gaps... this is the basic premise of the dribble-drive offense. The dribble-drive zone offense is a guard-oriented offense that features spreading the floor and dribble-penetration, but instead of getting to the rim for lay-ups, we may have to adjust (especially against the 2-3 zone and packline defenses) and have our dribble-penetrator pull-up in the paint or at the free-throw line or elbow and shoot the jump-shot, or dump it to O5 inside, or kick it out for an open three-point shot. Most of this article discusses attacking the 2-3 zone as this is most common zone defense that you will encounter. 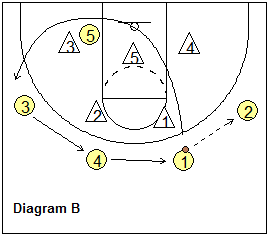 Diagram B shows the offense starting against the 2-3 zone defense. Now I had always believed that against a two-guard zone front, you must run a zone offense with a one-guard front, like the 1-3-1. However, I have been very impressed with how well spreading the floor with the 4-out set and attacking with the dribble-drive works. Notice in diagram B in our 4-out set that O2 and O3 start higher on the wing. 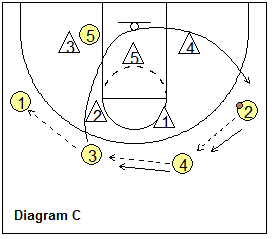 Diagrams B, C and D show a simple continuity offense with passing and reversing the ball. The rule is simple... when either player at the top passes to the wing, he cuts through to the opposite side, as the other perimeter players rotate to fill the vacated spots. I think you could run this continuity as a drill, just to get the players to understand how the perimeter spots must be filled. So here O1 passes to O2 and cuts through as O4 and O3 rotate to fill the spots. We always want our perimeter players to locate in our six basic spots... the four spots seen in these diagrams, or either corner. It's very important that we fill those spots. In diagram C, O2 passes back to O4, and O4 passes to O3. On the pass to the wing O1, O3 cuts through to the opposite side. Notice the continuity here. Also notice that the only time the cut-through is made is on the pass from the top to the wing. We don't want players cutting after every pass (as in the Read and React offense), as this will tend to clog the middle. Notice also, that so far, we have not shown any "dribble-drive" action... just all passing. You can use this continuity action for a few passes, to get the zone to move and shift, and then it is often easier to dribble-penetrate. Or you may choose not to run this continuity, but rather just spread the floor, make a few passes and then dribble attack. Diagram E shows O1 attacking the top gap between the two top defenders. This may be difficult when first initiating the offensive possession, but the opportunity will present itself after a few passes to the wings, or after a wing-wing skip-pass in which case these top two defenders get a bit stretched out. As O1 attacks the gap, he has options. O5 should try to "box-out" or seal the X3 defender for inside position. O1 might be able to get a pass inside to O5 here, especially if the middle low defender comes up to stop O1. Alternatively, if the X3 defender has inside position (diagram F), O5 simply pins (screens) X3 inside, and O3 (who moved down to the corner) is wide open for the kick-out pass from O1. 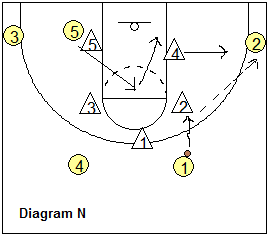 O3 can shoot the open 3-pointer, or pass inside to O5 who now seals the middle X5 defender and posts up. On O1's dribble attack, O4 fills in behind O1 ("safety" position) for a kick-back pass (diagram G). O4 will often have an open 3-point shot here, as the X1 and X2 defenders get sucked inside by O1. After pitching back to O4, O1 fills the spot vacated by O4. O4 might decide to attack with the dribble toward the right elbow. O4 could have a jump-shot here, or a pass to O5 inside, or the wide open kick-out pass to our shooter O2 for the open 3-point shot. Diagram H shows O1 attacking the X1 defender toward the right elbow. O1 makes the kick-up pass to O2 and O1 goes to the ball-side corner. We call this a "loop-2". 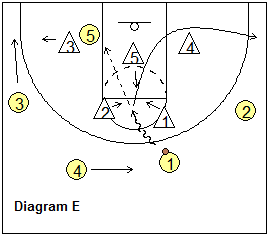 O2 could shoot the 3-pointer or dribble-attack toward the elbow (diagram I). O2 could have an elbow jump-shot, a pitch back to O4 filling the top spot, a pass inside to O5 boxing-out, or a "kick-over" pass to an open O3. O1 might even be open in the corner for a return pass. 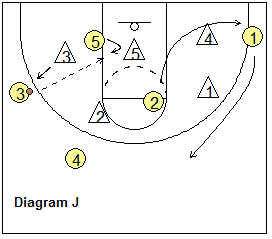 When O3 receives the pass (diagram J), he could shoot the 3-point shot, or look to pass to O5 inside. 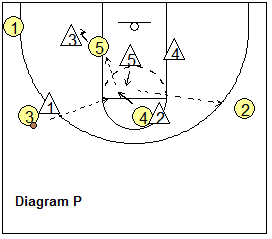 To post up, O5 finds the middle X5 defender, seals him and posts up for the pass from O3. Or, not shown here, O3 might dribble attack the elbow from the left wing. O4 would then rotate in behind O3 for a possible pitch-back, or O3 could look for O5 inside, or O1 (who has rotated back up to the top), or O2 on the opposite wing. Diagram K shows an easy attack from the wing. Sometimes the X1 defender will come out and pressure O1 early as O1 dribbles the ball into the forecourt. O1 simply passes to O2, and now O2 can attack the elbow again. O2 may have the shot, or the pass to O5 sealing inside. O1 fills in behind O2 and could get the pitch-back. O2 could kick-over to O3. O4 rotates to the top. If the pass to O5 is not there, after passing out, O2 cuts through to the left corner. Against the 2-3 zone, the baseline dribble is often not a good thing because of the three low defenders. We prefer to attack the elbows and top. However, there may be times when the defense is out of position and the baseline dribble might be a great move. An example might be after a wing-wing skip-pass (diagram R above). The wing player O3 makes a shot-fake and as the defender flies by, he makes the baseline dribble. So be a basketball player and as Coach Petitgoue states, "forget what coach said" and make the play. 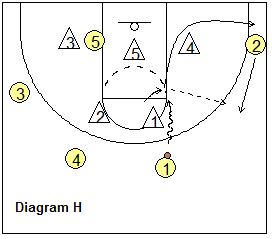 Here, the opposite wing O2 should move down to the opposite corner for a possible pass, and we like O5 to "T-up", or "I-cut" and slide up the lane line in order to create spacing for the baseline drive, and for a possible pass from the dribbler. 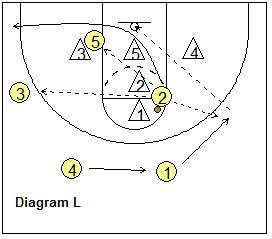 Lastly, we would attack other zone defenses with the baseline dribble (1-2-2 or 3-2 zones). Diagrams E-F-G and K-L above show pitch-back passes. A really good way to get an open 3-point shot is to have a player dribble-drive, and then have the adjacent perimeter player fill in right behind him on the 3-point arc, in what we call the "safety" position. There are two good things here. First, if we always fill the spot vacated by the dribbler, the dribbler will know that if he gets caught inside, he can always pitch back to the safety, because the safety is always open. What happens is the defenders get sucked inside and there is no-one to deny the pass to the safety. Secondly, the safety usually has a wide-open 3-point shot. Notice in diagrams M and N that against the 1-2-2 or 3-2 zones, we put O2 and O3 down in the corners. This puts more pressure on the low defenders and we can attack these zones successfully from the corners. The middle is open in these zone defenses (diagrams M and N), so O5 will cut up into the middle and has the options of either following the ball, or playing "away". When following the ball, O5 will be on the ball-side block when the ball is in the corner or low wing area. He'll locate at the elbows when the ball is on the wings, and flash to the middle when the ball goes to the top. 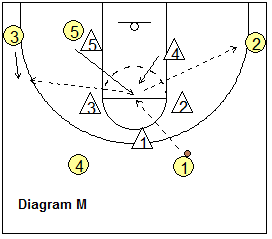 In diagram M, when O5 receives the pass at the high-post, he can pass out to the either corner, and then dive to the ball-side block for a return pass inside. In diagram N, O1 dribbles at the X2 defender and kicks it out to O2 in the corner. O5 dives to the ball-side block for a pass from O2. If X4 leaves too soon to cover the corner, O1 might be able to pass directly inside to O5. 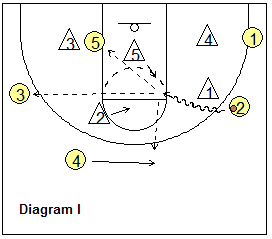 What about the 1-3-1 zone defense? Coach Petitgoue doesn't usually use this dribble-drive zone offense against the 1-3-1 as the middle and elbows are too clogged with defenders. Instead he uses a separate zone offense vs the 1-3-1. We would probably use our "Zone-2" baseline runner offense. You might want to put O4 at the high-post at times, and this now looks like any 1-3-1 alignment. Coach Petitgoue has O1 pass to a wing, and then cut through to the corner (diagram O). This alignment will tend to negate attacking the middle with the dribble from the top or wings. However, if you use O4 as a screener, you can still use the dribble. 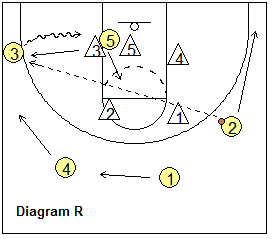 For example, although not diagrammed here, after O1 passes to O3, O4 can ball-screen for O3. 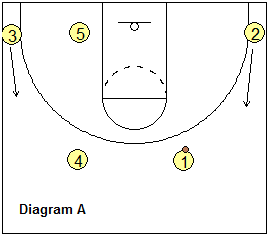 O3 dribble-attacks to the free-throw line area. As the X2 defender moves in to stop the dribble, O3 kicks the pass out to O2 (our shooter) who is wide open on the wing. When using O4 in the middle, Coach Petitgoue likes O4 to "box-out" or seal for position to get the pass from the wing. In diagram O, as the pass goes to O3, O4 finds and "boxes-out" X2 for inside position and gets the pass from O3 (diagram P). 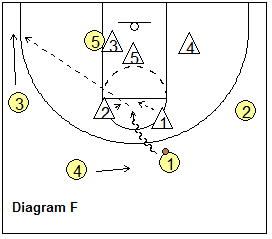 O5 "boxes-out" the X3 defender for inside position and could get the pass from O4. 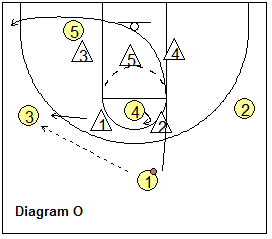 Or O4 could reverse the ball out to the opposite wing O2. I think "Triangle" just gives us another "look" and it might confuse the defense for a few possessions. You can go to it also if for some reason the dribble-attack doesn't seem to be effective. 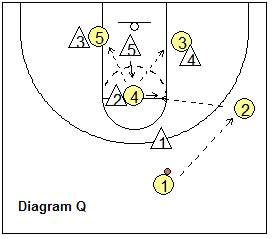 Diagram Q shows a set play. We start with O3 on O5 down low. 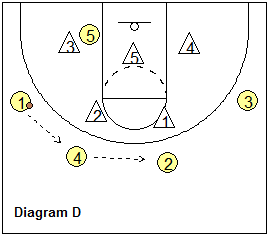 O1 passes to O2, as O4 boxes-out the X2 defender. O4 gets the pass while both O3 and O5 box-out the two outside low defenders X4 and X3 for a pass from O4. We have just discussed how O4 and O5 can "box-out" and screen the zone. O5 can also "pin" the outside low X3 defender to get O3 open for a kick-over pass (diagram F). The "pin and skip" is also a good tactic, and is the same idea with O5 pinning X3 as O3 goes to the corner. O2 simply skip-passes across to O3. If your team is guard-oriented, I think you will like both the dribble-drive man offense and this dribble-drive zone offense. We are finding that we can save a lot of practice time and greatly simplify things for our players by not having to teach and drill a separate zone offense (other than perhaps a simple 1-3-1 zone attack). We find that the dribble-drive zone offense is simple and effective. We will go up and down the court 5-on-5 in practice, interchanging the defenses between man-to-man and zone, and just let the kids attack. The dribble-drive zone offense keeps players moving and aggressive and avoids some of the stagnation, standing around, and predictability that sometimes occur with other conventional zone offenses. Get Coach Petitgoue's DVD!